The Phi Kappa Phi Literacy Grant Selection Committee and the Society Board of Directors recently notified Cazenovia College that its literacy grant proposal, Multicultural Books in Early Childhood Students' Hands, has received full funding in the amount of $2,000. This project will allow faculty with expertise in the area of multicultural literacy and literature the opportunity to provide Cazenovia College students in ED 325- Multicultural Literacy class and the Cazenovia Community Preschool (CCP) staff with training for how to integrate high quality multicultural literature into their instruction. Miller added, "College students in ED 325- Multicultural Literacy will gain real life experience in curriculum design and implementation, while the preschool students from Cazenovia Community Preschool will have their literacy instruction enriched through the integration of multicultural literature and literacy resources." 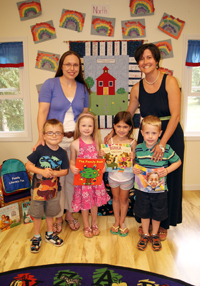 In the upcoming fall 2014 semester, Dr. Miller’s education students will make multicultural-themed backpacks filled with books and literacy activities and give them to the Cazenovia Community Preschool. College faculty and students will also train the CCP staff on how to integrate the backpacks into their instruction. Educators at both Cazenovia College and the Cazenovia Community Preschool hope that through providing such resources the preschool students will not only gain literacy skills but will also gain the positive lifelong skills of embracing diversity and understanding the role that they play in the global society. Founded in 1897 at the University of Maine, Phi Kappa Phi is the nation's oldest, largest, and most selective collegiate honor society for all academic disciplines. Its chapters are on more than 300 campuses in the United States, Puerto Rico, and the Philippines. Each year, approximately 30,000 members are initiated. Since its founding, Phi Kappa Phi has initiated more than 1 million members into its ranks; it is a global network comprised of the best and brightest from all academic disciplines - a community of scholars and professionals building an enduring legacy for future generations. The Literacy Grants program was initiated to mobilize members and resources of Phi Kappa Phi and the higher education community to champion literacy initiatives. Grants of up to $2,500 are available to Phi Kappa Phi chapters and individual members to fund ongoing literacy projects or to create new initiatives. The Society's commitment to the cause of literacy grows out of and is consistent with its mission, which was expanded to include "…and to engage the community of scholars in service to others."